The public is evenly divided over whether the U.S. should be active in world affairs, but the share expressing positive views of U.S. global involvement has increased since 2014. In addition, more Americans say that the United States should take into account the interests of its allies when conducting foreign policy than did so just a year ago. There has been less change in overall opinions about the principle of “peace through strength.” As in the past, more people think the best way to ensure peace is through good diplomacy rather than military strength. And, when it comes to views of U.S. standing in the world, a majority of the public continues to view the United States as “one of the greatest countries in the world, along with others.” Smaller shares say either that the U.S. “stands alone” among nations or that there are other countries better than the United States. 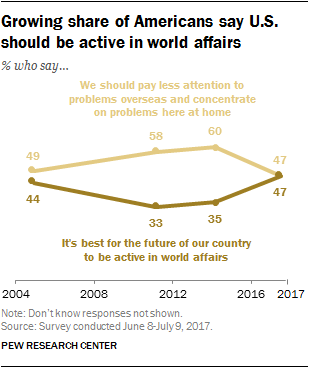 Just three years ago, 35% said it was best for the U.S. to be active globally, while a majority (60%) said the nation should pay less attention to overseas problems. This overall change in opinion since 2014 is almost entirely the result of shifting views among Democrats and Democratic-leaning independents. As a result, while there was no partisan gap on this question in surveys conducted during the Obama administration, there is currently a wide divide. Today, a 56% majority of Democrats and Democratic leaners say it’s best for the future of the country to be active in world affairs while 39% say the country should pay less attention to overseas problems and concentrate on domestic problems. In 2014, the balance of Democratic opinion was the reverse: 58% said the country should focus more on problems at home, compared with just 38% who supported an active U.S. role in world affairs. While the views of both liberal Democrats and conservatives and moderates associated with the party have shifted, the shift is more pronounced among liberals, and what was a modest intraparty gap has widened. Nearly seven-in-ten (69%) liberal Democrats say it’s better for the nation to be active in world affairs while just 27% say there should be less focus abroad and more on problems at home. Conservative and moderate Democrats are split on this question (46% say more active, 48% say less attention overseas). 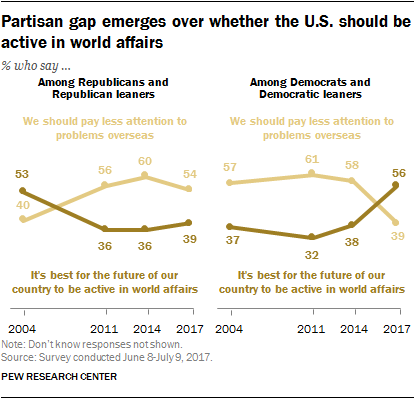 Among Republicans and Republican leaners, 54% say the country should pay less attention to problems overseas and concentrate on problems at home, while 39% say it’s best for the country to be active in world affairs. Views have shifted only modestly from 2014, when 60% favored focusing more on problems at home and 36% backed an active role for the country in world affairs. As in the past, there also are substantial educational differences in opinions about the country’s global role. Nearly two-thirds of those with at least a four-year college degree (64%) say it’s best for the nation’s future to be active in world affairs. Only 40% of those who have not completed college say the same. Among both groups, the shares favoring an active global role for the U.S have increased since 2014 (by 13 percentage points among college graduates and 11 points among adults with less education). The partisan gap on this question is relatively modest: 70% of Democrats and Democratic leaners and 60% of Republicans and Republican leaners say U.S. involvement in the global economy is a good thing because it provides the U.S. with new markets and opportunities for growth. Positive views of U.S. involvement in the global economy are especially high among better-educated adults. Nearly eight-in-ten (78%) college graduates say the U.S. involvement in the global economy is a good thing. A smaller majority of those who have not graduated from college (59%) share this view. When it comes to dealing with U.S. allies in global affairs, nearly six-in-ten (59%) say the U.S. should take into account the interests of its allies even if it means making compromises with them; 36% say the U.S. should follow its own national interests even when its allies strongly disagree. The share saying the U.S. should pay heed to the interests of its allies has increased 8 percentage points since April of last year (from 51% to 59%). This shift has come entirely from Democrats, while the views of Republicans are unchanged from a year ago (41% say this). 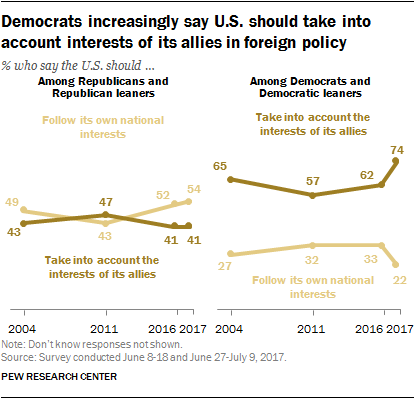 The share of Democrats and Democratic leaners saying the U.S. should take allies’ interests into account in making foreign policy has risen 12 points (from 62% to 74%) since 2016. As was the case in 2016, there are ideological differences in both parties over cooperating with allies. 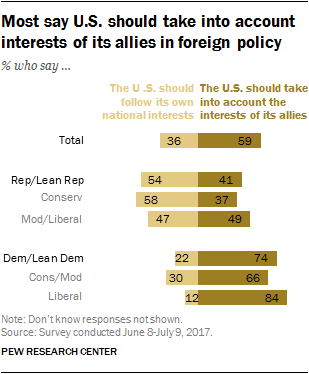 Nearly half of moderate and liberal Republicans say the U.S. should consider the interests of its allies, compared with 37% of conservative Republicans. Among Democrats, 84% of liberals say the U.S. should take allies’ interests into account, compared with 66% of moderate and conservative Democrats. Among both groups of Democrats, greater numbers favor this approach than did so in April 2016. For more than two decades, majorities have consistently expressed the view that good diplomacy, rather than military strength, is the best way to ensure peace. Today, 61% say good diplomacy is the better way to ensure peace, while just 30% say military strength is the better approach. But while overall opinions have been fairly stable, the partisan gap in these views – which has long been substantial – is as wide as at any point since the question was first asked in 1994. In the current survey, 83% of Democrats and Democratic leaners say good diplomacy is the best way to ensure peace. That is little different from a year ago (80%) but is an all-time high among Democrats. Just 33% of Republicans and Republican leaners say peace is best ensured with good diplomacy – which is among the lowest share saying this since the question was first asked in 1994. As recently as 2014, 44% of Republicans said good diplomacy provided the best way to guarantee peace. Opinion on this question has fluctuated in a relatively narrow range over the last decade, with neither view being held by a clear majority of the public. 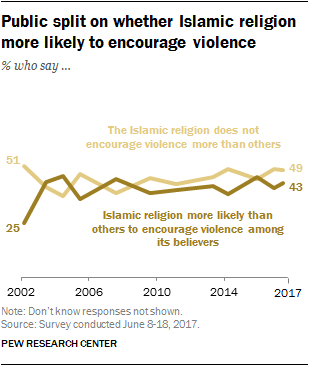 In 2002, when the question was first asked shortly after the Sept. 11th terrorist attacks, more said the Islamic religion did not encourage violence among its believers (51%) than said it did (25%); 24% did not offer a view. While overall public views have shifted only modestly, the partisan gap on this question has steadily widened over the past several years as a growing share of Democrats say Islam does not encourage violence more than other religions, while the share of Republicans who say that it does also has grown. As a result, what was a 11-point partisan gap in 2002 between the shares of Republicans and Democrats who saw Islam as more likely to encourage violence than other religions has grown to 40 points in the current survey. Today, about two-thirds (65%) of Republicans and Republican leaners say the Islamic religion is more likely to encourage violence among its believers than other religions. Throughout much of the 2000s, roughly half of Republicans expressed this view. 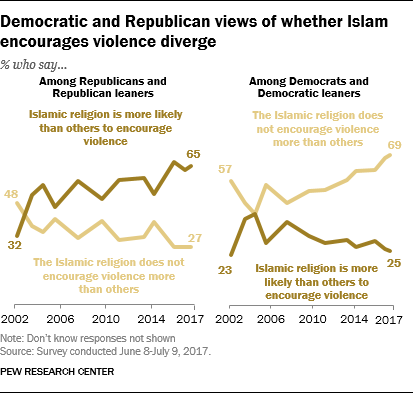 Among Democrats and Democratic leaners, 69% now say that the Islamic religion does not encourage violence more than other religions. The share expressing this view is as high as it has been in Pew Research Center surveys dating to 2002. The public is roughly split over the question of whether Americans need to sacrifice some privacy and freedoms in order to be safe from terrorism. About half (51%) say sacrificing some privacy and freedoms is necessary to be safe from terrorism; slightly fewer (46%) say Americans do not need to do this. There is an age gap in these views, with adults younger than 50 somewhat more likely to say Americans do not need to give up privacy to be safe from terrorism (51%) than to say that they do (46%). Older adults lean in the opposite direction: 56% of those 50 and older say Americans need to give up some privacy to be safe from terrorism, compared with 39% who say they do not need to do this. The partisan differences in attitudes about privacy and terrorism are relatively modest. By 54% to 42%, more Republicans say that Americans need to sacrifice privacy and freedoms to be safe from terror. Democrats are evenly split: 50% say Americans need to sacrifice some privacy and freedoms to be safe from terrorism, while 48% say they do not. As has been the case for the past several years, far more people say that the United States is among the world’s greatest nations than say it stands above all other nations or that it lags behind other countries. Just 12% of those younger than 30 say the U.S. stands above all other countries, the lowest percentage in any age group. Among those 65 and older, 44% say this. Partisans’ views on this question differ as well. Republicans and Republican leaners (41%) are about twice as likely as Democrats and Democratic leaners (19%) to say the U.S. stands above all other countries in the world, but larger shares of both groups say that the U.S. is among the greatest countries, along with others (52% of Republicans, 60% of Democrats). Just 7% of Republicans and 20% of Democrats say there are countries better than the United States. These views have been largely stable over the past several years.